The F-35 could benefit from a faster missile though. weasel1962 wrote: The F-35 could benefit from a faster missile though. OLD news with some extra details. 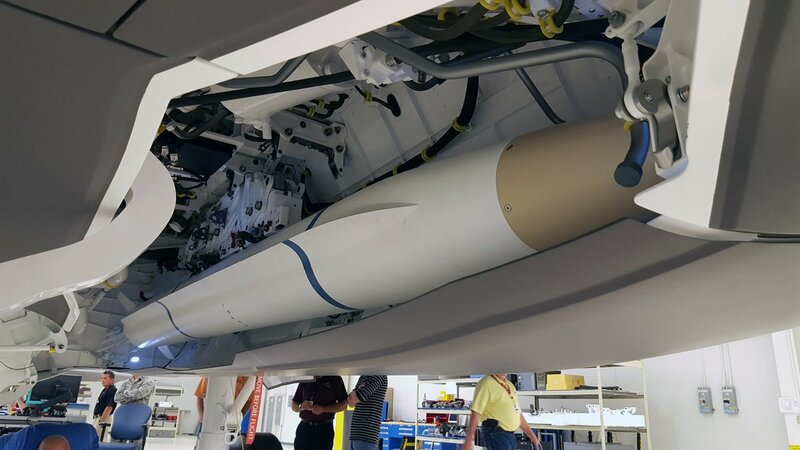 "WASHINGTON — A Joint Strike Missile, fired from an F-16 Fighting Falcon, successfully struck its target during a July 16 test at the Utah Test and Training Range. According to Norway’s Ministry of Defence, the missile changed its course in flight to avoid a decoy target before scoring the hit…. ...“JSM demonstrated its remarkable ability to recognize and destroy specific targets in challenging flight conditions,” said Mike Jarrett, Raytheon air warfare systems vice president. “This test signaled the completion of an important phase of development, and showed promising progress for this missile to outpace some of today’s toughest defense systems.”..."
Spaz, I'm aware of that thread. Perhaps I posted in the wrong JSM thread? This one is the most recent JSM thread my search revealed. The UK has not expressed any real interest in the JSM? There has been no publicly announced intent to further refine the JSM to fit the Killer Bee? To one of my original questions... has anyone any idea how much further the JSM would have to be shortened to fit the Bee? Round numbers are fine. Are we talking a couple inches? (e.g. 5cm) A foot? (0.3m) More? sorry to bring this old quote back up but I never noticed an answer. Considering that UK warships don't carry a heavy anti shipping armament, the B will be the UK's only carrier aircraft, and it has somewhat shorter legs than the A and C, the Royal Navy (and any other relying on the B for carrier aviation) would really benefit in maximizing the plane's maritime strike capabilities and how far out the fleet can reach without compromising LO. No news means there is NOSE KNEWs. Can't say without information - no new information - nobodies nose knows. CAPICE? steve2267 wrote: the Royal Navy (and any other relying on the B for carrier aviation) would really benefit in maximizing the plane's maritime strike capabilities and how far out the fleet can reach without compromising LO. Both JSM and LRASM have a hell of a reach, and either could be launched from well outside sensor detection range of a maritime target and well before a maritime target could deploy anti-ship missiles at the carrier. 25 years from now it might be far more critical to have legs for weapons in the AA role, assuming China realizes some of their blue water navy goals related to naval aviation. UK F-35B future standoff weapon is the Spear 3 at Block 4, eight of which can fit in the internal bay. Obviously it's a small weapon ~250lb but it will have a >60nm range so can be delivered stealthily. The UK has not really decided on a future specific anti-ship weapon for Typhoon/F-35B apart from the 2030s FC/ASM even though the Marte ER is going to be certified earlier for a later generic Typhoon enhancement phase. Introducing and maintaining a mixed inventory of Naval Strike missile, Harpoon and Marte ER seems likely to be uneconomic, particularly given longer term development plans for the Anglo-French Future Cruise/ Anti-Ship Weapon (FC/ASM). Provisionally to be known as Perseus, FC/ASM is intended to be the Royal Navy long term replacement for Harpoon on UK warships, and for Storm Shadow on RAF aircraft, but will not enter service until 2030. Other available options include the RBS15 Mk3 – a comparison of key characteristics of in-service and future missiles is set out below. tjh8402 wrote: Considering that UK warships don't carry a heavy anti shipping armament, the B will be the UK's only carrier aircraft, and it has somewhat shorter legs than the A and C, the Royal Navy (and any other relying on the B for carrier aviation) would really benefit in maximizing the plane's maritime strike capabilities and how far out the fleet can reach without compromising LO. For what's worth the UK warships do and still carry the Harpoon missile ("your" heavy anti shipping armament). They (Harpoons) are carried by the new Type 45 Destroyers as well as by the older Type 23 frigates. There was a plan by the U.K. Ministry of Defense to retire the Harpoon missile this year (2018) but this plan was postponed/delayed to at least to 2020 but likely even further down the road and the possibility of upgrading the Harpoons is apparently not out of the question which would extend the Harpoon's life/service until a definitive replacement can be procured. Regarding the rest, namely about mounting "heavy" Anti-ship weapons on the F-35B, I believe that other's have covered this up pretty well. Moreover, even a F-35B armed with internal Paveway IV bombs and together with its Stealth Capabilities would still be a major/huge threat to be reckoned with even against well armed warships. Yes, I knew about the Harpoon. I didn't mean to suggest they had no anti surface capability, just that it's limited. I believe they only carry 8, and it's the older shorter range version. The Russians and Chinese are obviously far ahead, and the USN is quickly moving forward with the LRASM, NSM, and SM-6, along with having newer Harpoons. I agree that the B has heavy hitting available anti shipping options, it's just that you have to choose between hitting long range targets and LO. You can have one or the other, but not both. Have you concidered Royal Navy may not be interested in employing carrier group as an anti-surface asset at all? tjh8402 wrote: ... it's just that you have to choose between hitting long range targets and LO. You can have one or the other, but not both. A long-range or even medium-range standoff aircraft with external missiles in anti-surface role means the launch aircraft and the launch itself can remain NLOS and undetected. Are you presuming that an F-35B with a long or medium-range VLO missile will be detectable at such a launch range? Even if they were LOS profiled, I doubt it. A JASSM missile remains a VLO missile when attached to the pylon, and if the Jet it's attached to is an F-35B the package remains VLO with the possible exception of the pylon. And there is some question as to the pylon's LO qualities, but this does not mean they will be giving away the F-35 to tracking. It just means its detection radius in that config will be a larger bubble, but hardly an easy RCS target to detect and track at medium strike range. The Royal Navy funding is a bit broke at present, and quite a bit of political and economic uncertainty. They're no doubt waiting until that changes before moving to a more capable strike weapon but they do have other means of delivery of things like Tomahawk to kill ships. And NSM is a likely candidate during the next decade, in just about every allied navy, plus JSM could be carried externally by then, as well as LRASM, and it's hardly going to give away the location of an F-35B launching below radar horizon(s).